Since 1986 Eric Bari has been perfecting his trade as Pastry Chef and Chocolatier. After 2 years apprenticing in France he moved to Switzerland to master his trade for 4 years, and in 1992 moved to Canada. In 1994 he opened his own pastry shop on Roblin Blvd which he ran for 4 years. Then in 2001 Eric joined the culinary team at the prestigious Manitoba Club, private members club. Where he worked for eight years as the Head Pastry Chef. After Eric's tenure with the Manitoba Club he relocated to Hecla where he helped in the start-up of the newly renovated 5 star Radison Hecla Oasis Resort at Hecla Island which he worked as the Head Pastry Chef. While working for the Radison he became involved with the Aromansse Retreat Centre and was hired on as their main chef and continues to work for them to this date. 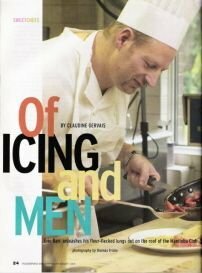 In October 2010 Eric was approached by Prairie Ink Restaurant & Bakery / McNally Robinson to head-up their bakery and work as their Executive Pastry Chef. Then in July of 2012 Eric returned to the Manitoba Club where he is now holding the title of Executive Pastry Chef. During his time abroad Eric has built up a large following of pastry lovers and to help satisfy their appetite for his dainties he has started this web site.